On Windows 10 PCs with at least "Version 1607" (Anniversary Update), this application can check your hardware and software to determine whether the device can support Windows Mixed Reality in its current state. Click here to download the Windows Mixed Reality PC Check app from the Microsoft Store. 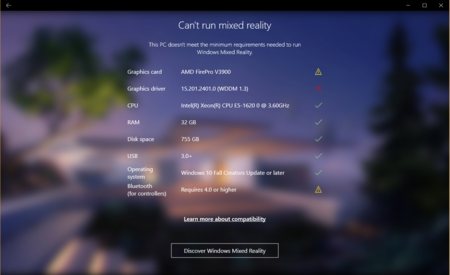 What versions of Windows can run the Windows Mixed Reality PC Check app? The Windows Mixed Reality PC Check app only works on PCs with at least Windows 10 Version 1607 (Anniversary Update) installed. To check your version of Windows, type "winver" in the search bar and run the command. For Windows 10 versions earlier than 1607, the app will still show up in the Store, but the user will get an error when attempting to install the app.